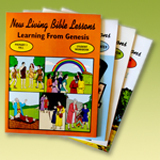 You can view sample lessons from the New Living Bible Lessons by clicking on the links below to download the lessons in PDF format. Sample lessons from a workbook and teacher manual from each age level for Nursery, Pre-School, Primary, and Junior are available. These lessons are for review only and should not be reproduced for classroom use.